Landscape: Langkawi, or more correctly Pulau Langkawi, is one large island close to the Thai border, with several smaller ones surrounding it. It is forested and hilly, with waterfalls and a complex coastline. Visited: We have visited Langkawi many times. 16-31 December 2006, 12-28 February 2007 with the boat in Rebak Marina while we toured Thailand for about 10 days, 2009 when we returned from Africa, 2010, 2014 after we launched from our Thai Refit, and 2015/6 after returning from Indonesia. 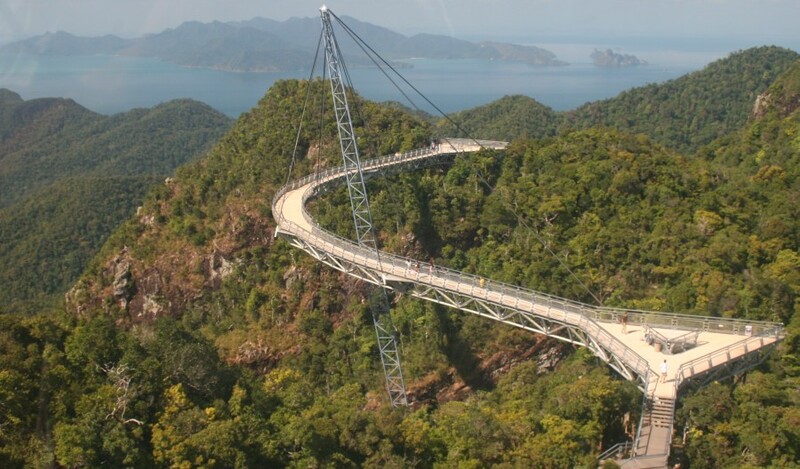 (Amanda) I enjoyed Langkawi for several reasons, most of which probably stemmed from the facts that Rachel and my brother were there and my friends Adam and Warren flew in to visit their parents on Scud while we were there. We were able to celebrate Christmas together on the boats in Kuah, and New Years in Telaga with several other families as well. In Kuah it was fun to go shopping, though with last-minute Christmas shopping it was sometimes more hectic and less 'fun'. The little tourist shops were certainly different and more personal than the big mega-malls we'd seen in Penang and Kuala Lumpur. New Years in Telaga we celebrated first as an afternoon potluck barbecue on one of the breakwater-island beaches (after a day of swimming and playing frisbee and making the fire) and then hanging out at the little restaurants and bars that surround the marina until a (rather small) fireworks display at midnight. Between Christmas and New Years we were at Rebak Marina working on Ocelot. It wasn't bad as haul-outs go, because not only were Chris and Rachel there to help, but Scud followed us into the marina. We were able to play Frisbee on the beach in the afternoons, or swim in the pool, or hang out listening to the live band. Unfortunately at that time the internet was down due to a distant earthquake which had broken a deep-sea communications cable, but that just meant we had to be extra social - not a big problem. We were able to take advantage of the on-the-boat wireless internet later, when we came back from Thailand to leave Ocelot and fly back into Thailand ... yeah, slightly convoluted, but it avoided a lot of bureaucracy. I usually don't like marinas for several reasons, but in Rebak it was okay... almost like taking your house to a resort and parking it. A bit of privacy invasion, but the benefits were worth it. In Telaga we'd heard about Telaga Tujuh ('Seven Wells' in Bahasa Malay) so we set off up the road to find it. It was quite a long walk, considering we didn't know where we were going, with a long, steep climb at the end up hundreds of steps, but the result was worth it. There's a stream that comes down off the mountain there, and right before it goes off a cliff down to near-sea-level, there are a series of natural waterslides, worn smooth by lots of water and people sliding down. 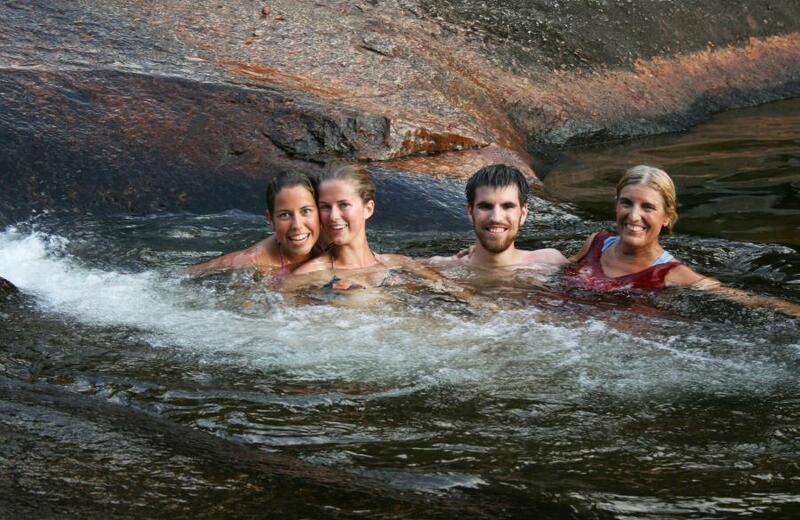 We had a great time there, slipping and sliding and cooling off in the water and frolicking about. Luckily the cliff itself was far on the other side of a fence barrier, so there was no danger of inadvertently going for a longer slide than planned. The slides were so much fun that we came back at least three times, despite the grueling hike up to the top. Masjid Al-Hana in Kuah, with its golden dome. 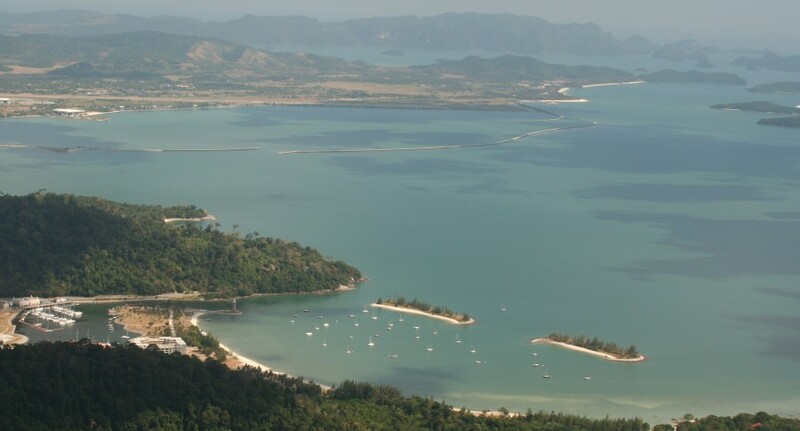 (Sue) Langkawi, with its duty-free status (good for bringing in boat parts), sometimes clear water, proximity to Thailand, and many small bays and offshore islands, is the yachting/sailing center of the western Malaysian Peninsula. Having arrived after the end of the SW Monsoon season, we were able to anchor in the bays on the west coast and we spent time in both Kuah and Telaga. The anchorage in Telaga with it lush hills, hiking trails, wildlife, and clean (if not always clear) water made it my favorite. To get things done, you have to spend time in the main town of Kuah. This small but busy town with its few hotels, marina, old-Malaysia feel mixed with new, is a busy port for the many (mostly Malaysian) tourists who come by ferry from the mainland for their duty free shopping. 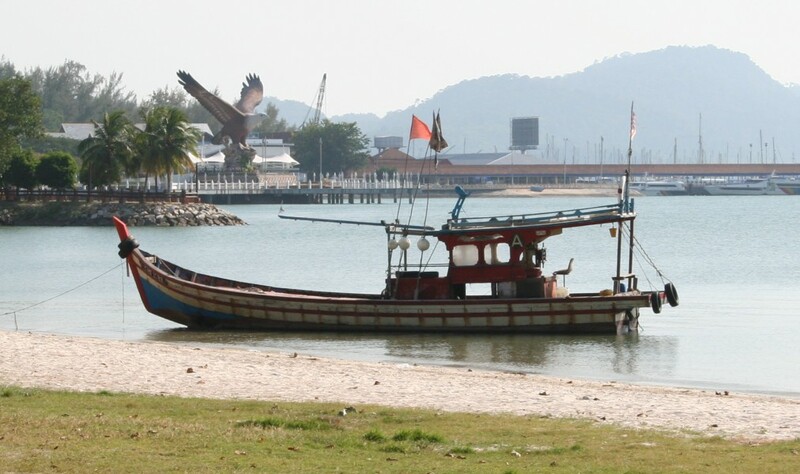 Ferries ply the waters from Kuala Perlis and Kuala Kedah several times a day, 7 days a week and there is a thrice daily international ferry to Thailand. Kuah was a great stop for us for Christmas shopping with all the imported items (like wines) and lovely handicrafts which made nice gifts. We poked around the back streets of town and found good hardware stores, electronics shops, souvenir stores and fresh fruit and vegetable stores. In the big mall near the ferry terminal was a fancy supermarket, close enough to walk to from the dinghy landing. Along the waterfront was a lovely botanical garden with fountains and shade trees along the beach where Muslim families often came to picnic. Next to it was the impressive Al Hana Mosque with it golden domes and Moorish arches. The garden and mosque grounds were a favorite jogging route not only for the yachties, but locals as well, early each morning. (Jon) We'd been aiming for Langkawi ever since Australia, as we'd planned to meet Aussi friends there. 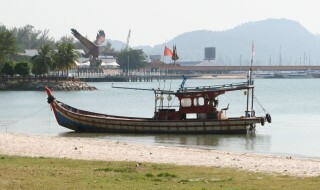 The grubby waters of the Malacca Straits were supposed to finally clear up and we could then swim and explore Thailand. The meeting never happened as our friends graciously cancelled their plans when my brother got sick and we had to fly home, but still, our nominal destination ever since Indonesia was Langkawi. Although Langkawi is a cruising destination all by itself, we really only went to 3 anchorages: Kuah (the main town, where we had Christmas), Rebak Marina (where we hauled Ocelot to replace the bottom paint and later left Ocelot while we toured inland Thailand) and Telaga in the north, where we spent New Years Eve. Curved walkway with its single support pole. The islands in the distance are in Thailand. Rebak Marina is nice enough as marinas go, but it's actually on its own little island just west of Langkawi and therefore a bit remote. The marina is part of a big resort-hotel complex, and marina guests were allowed to use most of the facilities. This included the big swimming pool, which made a relaxing end to a hard day's work. Most marinas charge multihulls like Ocelot an extra surcharge (usually 50-100%) because of our width, but Rebak had a special going and did not charge us anything extra. They had good wireless internet access right to Ocelot, and even the meals were reasonably priced (US$3.50) if we ate in the big covered area by the work-yard. Although it was only 6 months since we'd last anti-fouled Ocelot (on the beach in Darwin) the Australian bottom paint had died. This is why we tend to buy our bottom paint in 3rd world countries - it lasts longer and generally works better. For example, the paint we'd put on in Venezuela was still going strong after 2 years. So we bought some locally brewed paint in Kuah and hauled Ocelot in Rebak just after Christmas. Since we had Christopher and Rachel with us, the job went very quickly - about 40 hours to service the saildrives and escape hatches, add a second grounding plate, and paint 2 coats on the hulls and 4 coats around the waterline. Rachel was the first visitor that we've subjected to helping us haul Ocelot, but she's a cruiser and jumped in to help with a will. Telaga, up in the north, actually had the most to do. There was nightlife for the teens (there were about 7 there over New Years), a delightful natural water-slide in a clear, freshwater stream for the afternoons, and a fun sky-ride - a cable car to the top of the highest mountain. At the top was an interesting curved walkway suspended over a deep canyon by a single pole. The views from the top were stunning, with the yachts down below us and Thailand to the north.